My husband Matt (aka. “Mr. 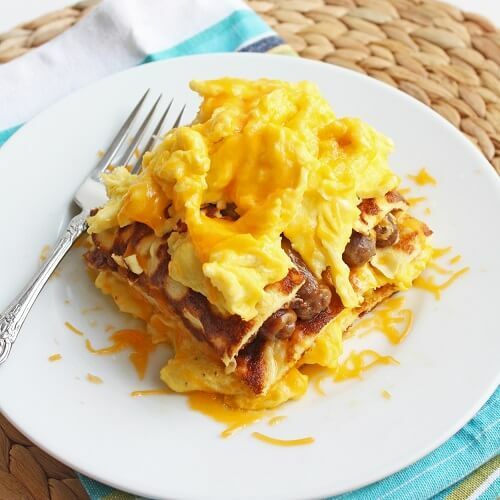 Hungry”) gets credit for this breakfast lasagna recipe idea. When he first mentioned it as a breakfast possibility, I thought it would be pretty cool to try. I wasn’t on a low carb or gluten free diet at the time, and thought I might use a traditional noodle and layer different breakfast meats, eggs, cheese, etc. I added it to my list of recipe ideas to pursue for the blog, and then forgot about it for awhile. I recently remembered it, and thought it might work as a low carb breakfast option, using the cream cheese pancakes to stand in for the noodles. I had some pancakes leftover in the fridge from the low carb caramel machiatto tiramisu I posted the other day, so I made it for breakfast this morning. It’s yummy! 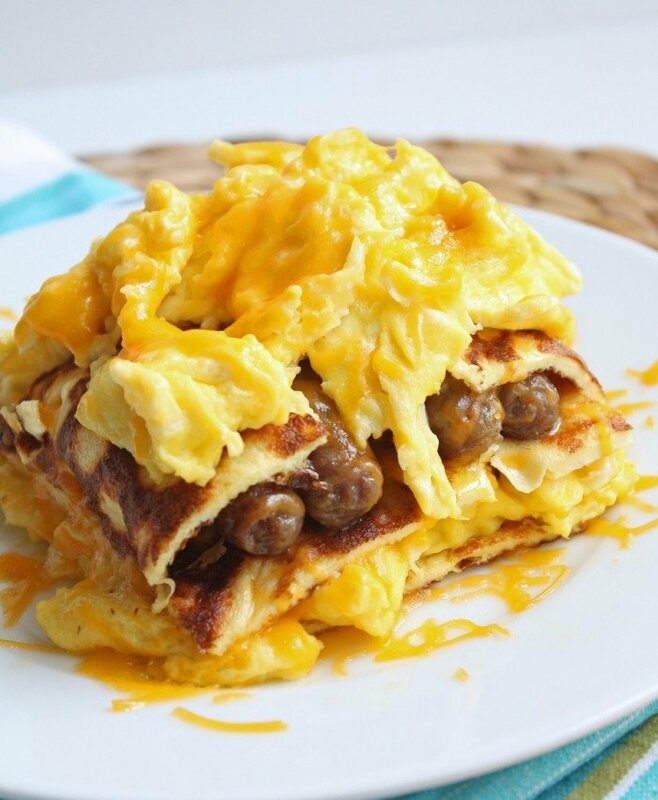 I kept it simple, and just layered breakfast sausage links, fluffy scrambled eggs, cheddar cheese and the pancakes. I may try different variations of this recipe in the future (fresh herbs, goat cheese, mushrooms, onions, spinach – the sky’s the limit really!) but this is what I had on hand. 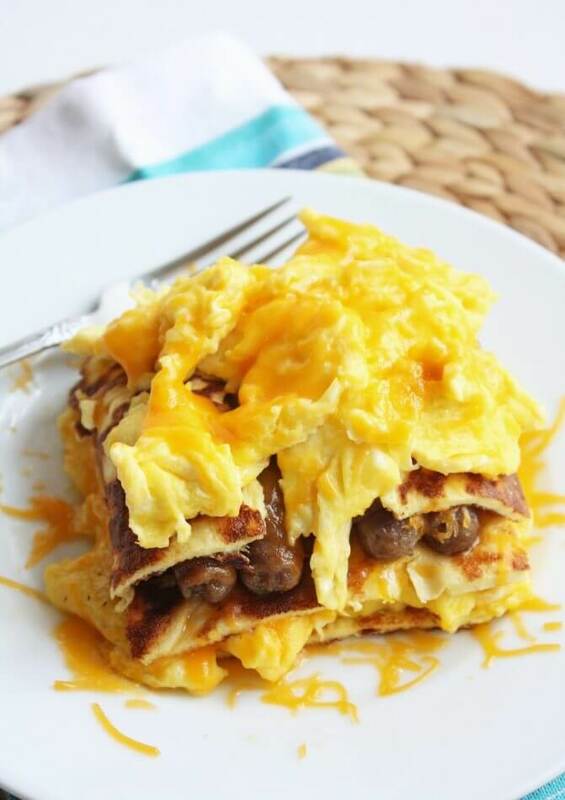 Even my son liked this low carb breakfast lasagna. As a bonus, you can make this ahead in a casserole form, and then gently heat in the morning for breakfast. If you like to mix savory and sweet in the morning, you could pour sugar free syrup on it, or use the stevia sweetened version of the pancakes for just a hint of sweetness. Play with it and let us know if you come up with any cool variations on this recipe! A low carb and gluten free recipe for breakfast lasagna. 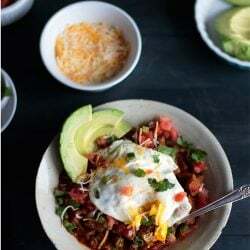 Can be assembled the night before, so it’s perfect for brunch or a lazy Saturday morning. 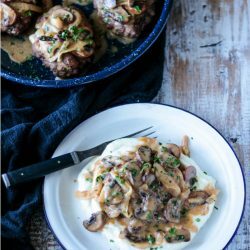 Serve with Hollandaise sauce to make it even more decadent! Cover the bottom of an 8 x 8 pan with 4 pancakes, it’s ok if they overlap. Put down a layer of scrambled eggs, followed by one third of the cheese. Cover with another 4 pancakes, then add all of the the sausage links. Sprinkle with another one third of the cheddar cheese. Add the last layer of pancakes, followed by scrambled eggs, and the remainder of the cheese. You can use more cheese if you like. Bake in the oven for 8 – 10 minutes at 350 degrees (F), or microwave for 3 – 4 minutes on high, or until the cheese is melted. I still dream about this one… need to make it again soon! I am attempting to cook the cream cheese pancakes in sheets using my 8×8 pans in the oven. Ill let you know how that turns out. I don’t have pancake rings and find they run about my pan and with an uneven stove (grumble) its hard to cook them evenly. I didn’t see a clue in this recipe what cream cheese pancakes are. This looks delicious. Can you make this and then freeze it? 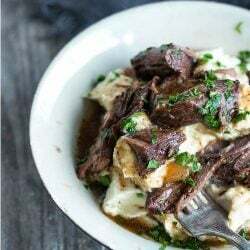 I am looking for healthy freezable meals for once I have my 1st baby in a few weeks. Sounds great thanks! I was thinking that spaghetti squash would be another possibility in place of the pancakes. That way, you would also be getting a vegetable in your breakfast. Do you mean recipe suggestions? If so, please check out the recipe index for a wide variety of recipes that may appeal to your dietary needs! I tried this last night with ham, and it was amazing. I think what really put it over the top though was on each pancake layer I poured a small amount of Walden Farm’s Zero Carb Pancake Syrup. It was great! Thanks for the recipe! It would obviously not be low carb but I bet it would be delicious! Hope you guys like them!!! Thank you so much for all your recipes! I continue to Pin just about every one I have come across! I hope to see more!! Thanks for sharing on Pinterest Melissa and I’m so glad you’re enjoying the recipes! For more great recipes that you can’t find on the blog, check out my new e-cookbook The Gluten Free Low Carber! Speaking of lasagna….I make a lasagna with thinly sliced zuchinni, cream cheese sauce made with cream cheese, milk and egg, american cheese and my usual homemade spaghetti sauce. It is sooooooo good and I don’t even miss the noodles!! How do i make the cream cheese pancakes?? 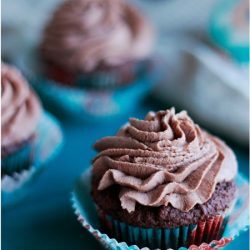 Sorry, the link was tied to the wrong post – it’s fixed now, just click on it and it will take you to the recipe. I haven’t tried the low carb pancakes yet but am planning to make them this week. What do you think about using the unsweetened version as a substitution for lasagna noodles? Do you think they would just get soggy and fall apart? I just did a lasagna recipe for the e-book I have coming out that uses a version of these pancakes for the noodles with good results. I bulk them up a bit with coconut flour though so not sure how they would work on their own.. Tried your pancakes, LOVED them!! My kids did to so that made them even better!! I thought it tasted a lot like french toast. Let me know how they come out Jamie! I do mine in the microwave an it works great! Will post a recipe for it soon! Thanks! Sounds delicious Adrina! I was thinking of using them as a regular enchilada substitute but haven’t gotten around to it yet! Hope your breakfast version comes out great! Congrats on 83 pounds! I don’t know a lot about the Dukan Diet but I think it’s also low fat in addition to low carb? If so, you may have to make some tweaks to make the recipes work for you but I hope you enjoy them and will report back! Thanks! Found your blog through Pinterest! I’m on the Dukan Diet (down 83 pounds!) and always looking for wonderful recipe ideas! Congrats on the 23 pounds and I can relate to the boredom issue. 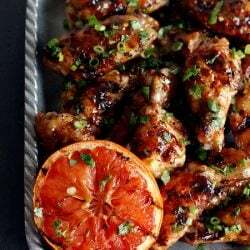 Unfortunately the only recipes I have available are published on the blog already and I post new ones as I create and test them out so your best bet is to subscribe by email and you’ll get emails as I post them – thanks! Hey Alysia, I sent you an email with some links to sites with tips and recipes – enjoy! Yup! I will probably do that soon since I’ve been craving lasagna lately! I did make a version with a chickpea crepe a few months ago that worked well – it was gluten free but not necessarily low carb. I’m sure this would work just as well! Thank you, thank you for this recipe! Just got done eating it and had to comment. This was delicious! I also made the sweetened pancakes for something sweet and savory. And the pancakes turned out wonderfully with a fat-free cream cheese. We sprinkled some sugar-free maple syrup on it, and it tasted just like a McGriddle. Super yummy! Thanks again for sharing such a great recipe! Thanks for the comment, I’m thrilled that you liked them so much! Also happy to hear it worked with the ff cream cheese since I’ve never tried it. Will have to give that a try too! Thanks! Yet another here who found you on pinterest and repinned you! I stumbled across the “pancakes” and then onto this lasagna. I made the pancakes this morning so I would know what to expect for the lasagna. They were fabulous. I’m wavering though on the lasagna. If I were using real noodles, I’d go straight to the eggs. But with the pancakes being so eggy, it seems like too much (for me). I wonder if you have tried any variations that don’t include extra eggs? I was trying to keep the carbs down, but I am not fully no carb. Just trying to find ways to cut where I can so I can save for the things I feel like I can’t do with out ;). Thanks for the repin! Pinning makes the world go round! :) I haven’t yet tried a variation without eggs. I did think the scrambled eggs had a totally different texture than the pancakes so I didn’t mind it. Another comment said they used the sweetened pancakes which could also set them apart from the scrambled eggs. Curious to know what you think if you try them! Made this for breakfast with sweetened pancakes. It was the perfect balance of sweet and savory. This is definitely going into my breakfast rotation! Glad you liked them Laura! I like the idea of mixing the sweet and savory – going to try that next time, thanks! 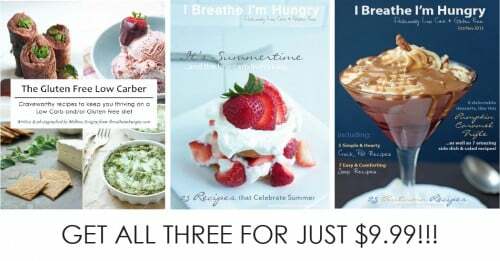 These recipes look amazing; I’m so looking forward to trying! Thanks Rebekah! I hope you like them! Wow! This is absolutely stunning … bring on the weekend when I have the time and the stomach for breakfast! Wow! Two wows! High praise indeed! :) Hope it lives up to your expectations when you actually taste it – love to hear back from you, thanks! This is a lovely idea to get healthy and low carb breakfast. You are truly amazing! I can not wait to try this! I’m so impressed by your recipes. Those cream cheese pancakes are delicious. Uh oh! That’s a lot of pressure! What if I’ve peaked and it’s all downhill from here???? ha ha! Hope not, still have a lot of ideas kicking around so we’ll try to keep you interested! Thanks Kelly! 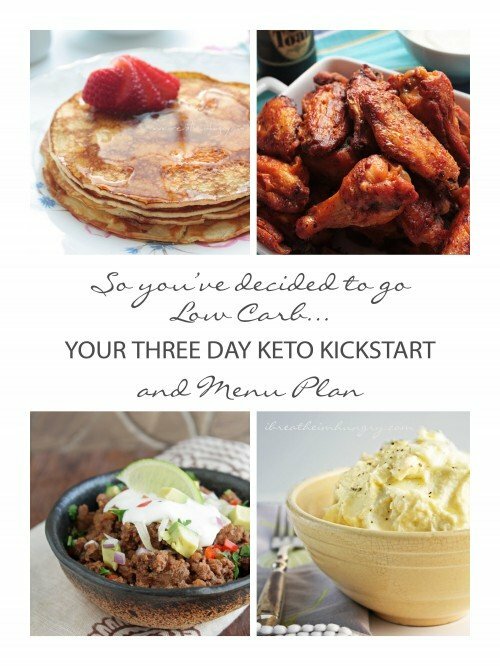 I’m flipping out on these…I really try to eat low carb, so this looks like something I need to make!!!! Wow. Thanks Charissa! There is no end to what you can put in this so it’s fun to experiment! I’ll be eating variations on this theme for weeks I’m sure before I get bored and move on to something else! :) Hope you like them! It seems like I’m putting a star in my Google Reader next to every single recipe that you’ve been posting lately. This looks absolutely fantastic! Those cream cheese pancakes are so intriguing to me….I will definitely get around to making this for breakfast one day!